I was born in 1941 and in my early childhood I lived at 40 Cleveland Park Crescent until my family moved away in 1950. I remember the VE Day party in the Avenue when Billy Nathan who was the "gang leader" won first prize in the fancy dress as a Black Clown myself winning second prize as a White Clown. Uncle Mac recruited from the Walthamstow Granada presented the prizes which in my case was a second hand book of wartime stories mainly of little boy's daddies who didn't come back from the war! Other members of our gang were Barry Tuttey (whose parents provided cine shows of Laurel and Hardy etc. with complimentary pop corn), Michael Forrest and a boy we called Ginger. During the blitz our house received a direct hit from an incendiary bomb which fizzled out embedded in the roof rafters. I recall my father relating the tale of our neighbour opposite who, being an industrious fellow, replaced his shattered windows the day after the bomb blasted them out, only to loose the lot again the following night! I was wondering if anyone had any information about 24 Countess Road, where my father, Raymond Roberts, was born in 1922. His parents were Thomas and Ethel, and Thomas worked as a poultry farmer after serving in the war. I would be interested in seeing some old photos of this area. Thank you. I, like everyone else it seems, have been delighted to have found this site on Walthamstow. I stumbled upon it in the course of searching for Cook's Folly in Walthamstow - I haven't found where Cook's Folly was - yet - but I have found a band of people with good memories of London E17. I was born in 1948 in Thorpe Coombe and lived in Farnan Avenue until 1965.I went to Chapel End infants, juniors and seniors until I was 13 and then to Clark's College in Walthamstow which I left when I was 16. I would be pleased to hear from anyone who might remember me. If anyone could let me know where and who lived in Cook’s Folly then I shall be most grateful! Dear John, I have just discovered your site on Walthamstow. I see that you live in Norwich. We live in Suffolk! I have discovered that several of my ancestors lived in Walthamstow (and various other parts of London) and at the end of July I am planning a trip to London to see if I can find some of the addresses. Obviously what I don’t want to do is waste time searching for houses that have long since been redeveloped and I was looking for a way of finding out whether the original houses still exist. I wonder whether you might be able to help me or, if not, suggest how I might find this out. My grandparents on my mother’s side were married at St. Michael and all Angels Walthamstow (picture in the Postcards Gallery) and the address of Albert George Saunders is given as 87, Edward Road. That of his bride, Annie Elizabeth Elisha, is given as 21, Courtenay Road. They married in 1911. The same Albert George was born at Manor Cottage, Higham Hill. Have I any chance of finding where that is or was? Albert was born in 1882. Hi - I was at Blackhorse Road Infant and Junior Schools - living in Pasquier Road. Then got evacuated with various mums and tots from St. Andrews School to Wicklewood in Norfolk. Came back to W'stow after a month away - set the 11+ and then went to William Morris Girls' Central School. Joined the Civil Service (Post Office Savings Dept. S.C.D.) and after 16 years got married and after five years moved to Ruislip Manor with two daughters. I was in the 1st Walthamstow Brownies and Guides and became the Captain of the Guide Company and then at 21 I was the District Guide Captain of West Walthamstow - leading the 12 Guide Companies in the Remembrance Parades and training the Guide Colour parties. I was one of the original 15 White Heather Scottish Dancers (all were members of the Scout and Guide movements) and last visited W'stow with my two daughters to attend the 40th anniversary of the club. I went with the club to Saarbrucken and we danced there on eurovision. I met Gisela Sweitzer there and she was one of my seven bridesmaids and also Godmother to my eldest daughter. I was at the opening of the S.W.Essex Technical College in Forest Road and remember using a type writer there. My brother actually attended the College and got a 1st class Matriculation and did an exam. called 'College of perceptors'. He was a Sea Scout and afterwards one of the leaders at the 2nd W'stow Sea Scout Group. I was Christened at St. Mary's Church as was my husband and my three children. My favourite in the High Street was the Sarsparella man - if my mum felt particularly wealthy she not only bought me a drink at the stall but also a bottle to take home. No drink since has ever measured up to the taste of that Sarsparella. The man at the stall would easily pass todays environmental rules - he wore white gloves, a black bowler hat and emaculate suit and had gleaming glasses and equipment on a pristeen white cloth on his stall. My dad was a general builder and he was a foreman on the building of the Jubilee underground- unfortunately he died of cancer before he retired and before the tube line was officially opened. My dad worked for the A.R.P. during part of the World War II before going into the Royal Marines and Mum had to do munitions work for the Ever Ready battery company. Who remembers the smell of Clarnicoes sweet factory ? My grandmother owned two shops joined together, at 54/56 Hoe Street, it was called Kempton's. She manufactured mattress's etc, at our factory in Leytonstone High Road. I lived there from 1938, my birth year, until 1956 when we moved to North Weald in Essex. My uncle was selling the shops, which left us with nowhere to live. We used to go to the stadium every week to see the Speedway, one of our relations was Vic Chandler, who owned the stadium , and used to exercise his greyhounds near where we lived in Epping. Rosin's was the bakers between Hawthorne Road and the Bell Corner, we used to queue at Methvens for our Rock Eel and 6thpennorth of chips on a Saturday lunchtime. My brother spent his saved up pocket money at the Toy shop, on Dinky Toys, and Airfix kits of the fighter planes of the war. Then was the chap that sold hats, and the shop that sold Dresses etc. The factory opposite us that made shirts. When I left school I worked in The Radio Hospital, when I worked there it used to rent out TV's, but I was upstairs making Radio and Amplifiers. After it was sold to Frank Strange, it was renamed Radio Unlimited, and sold components for radio and TV's and a lot else besides. Between us and that was the Surgery of Dr. Dave, an Indian with an English wife, they had two daughters' Pat and Penny. I also remember a cafe on the summit of the bridge over the railway, the waitress's wore uniforms like the Lyons Corner House girls. I also remember the Paper Man that called "Star News and Standard" in the doorway of the shop on the corner opposite the Bell. I believe he had something to do with Betting on the horses as well! illegal at the time I was told by my Dad. Not forgetting the Saturday morning pictures, Cartoons and Cowboys, especially Hopalong Cassidy, at the Empire. During the war, Holdstocks the Bakers, who had a shop up near Greenleaf Road, crashed into our shop, during an air-raid, it was killed obviously, and its hoof-mark was in the shop floor right up to when we left. It came down Tower Hamlets Road, opposite us, straight the front door. As kids we spent a lot of time in Lloyds Park playing football and cricket, and our school Wm. McGuffie put on our plays in the Pavilion, notably Toad of Toad Hall. Humphrey Lyttleton at the Assembly Rooms among other Jazz Bands of the time. "Onions" was a favourite tune, the audience used to stamp on the floor, till the place rocked. There are lots of other shops, Eckerts the Barber/Hairdressers, The Domestic Stores, Dr Scott on the corner of Ruby Road, the Shop that sold ribbons and lingerie run by an elderly lady, whose name I have forgotten, near Eckerts. I have a book or two on Old Walthamstow, The Avenue being prominent in it, and the old church of St.Mary's. my brother used to go to Cubs up there. Hope some of this is of interest, it's lovely to remember 'my' Walthamstow of old. 22 Feb 05: I came across your website when searching for Whipps Cross Hospital and I thought the attached photo may be of interest. My mother Margaret Robinson (seated 1st on left) had came from Northumberland to train as a nurse at Whipps Cross. 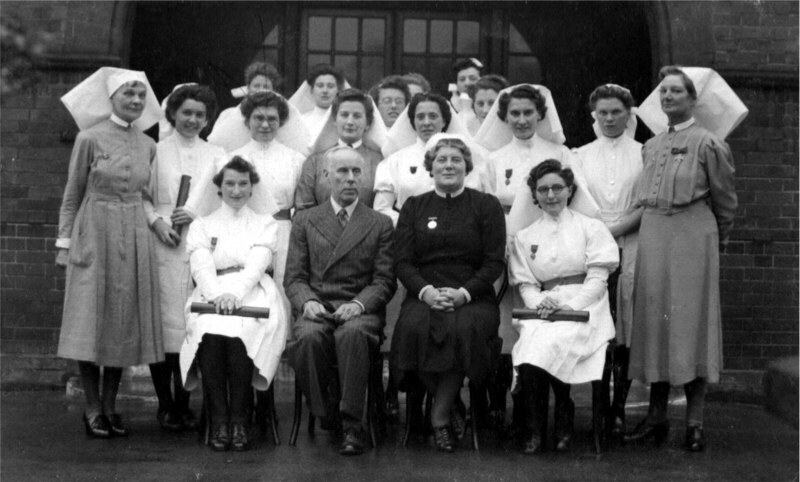 The photo is c1944 shows the newly qualified nurses. I do not know any of the other people but they may have lived in the area. My mother used to tell a story of how she returned to her room after her shift, to find all her clothes hanging on the trees opposite due to a bomb exploding. Anyway hopefully someone may recognize somebody they know. 06 Feb 05: Hi John, Great site! Thanks for the memories. I've just discovered your site via Friends Reunited and am responding to your request to "get in touch". I lived in W'stow from 1947 to 1964, my Dad had a shop there, I went to school at Forest Rd and Coppermill. My first job was at W'stow Town Hall but then I "went to the dogs" and worked in the kennels for W'stow Stadium. I emigrated to Toronto in 1964, where I had a successful career in Local Government (Info. Technology). I am retired and still live in Toronto. 25 Jan 05: Hi, Came across your wonderful website. I was brought up in Walthamstow and lived there until I married in 1955. My elder sister still lives in Walthamstow. We lived in 8, Carr Road, and then 2, Elphinstone Rd, my two sisters and younger brother attended Winns Avenue School, and were evacuated to Bricket Wood on 01/09/1939 - it was a Friday. I can clearly remember to this day the school practicing 'wave crossing' the road practicing for our long walk to Walthamstow Station (LMS). The teachers who accompanied us were Ms Ringer, Ms Howard (Moggie) and a Mrs Roberts - she left us soon after to return to W'stow. I can remember these two teachers with affection, they visited me when I was in hospital at St Albans. Our temp school was in Lye Lane Cricker Pavilion and in the Congregational Church (rear hall).